The Huttons go on safari. 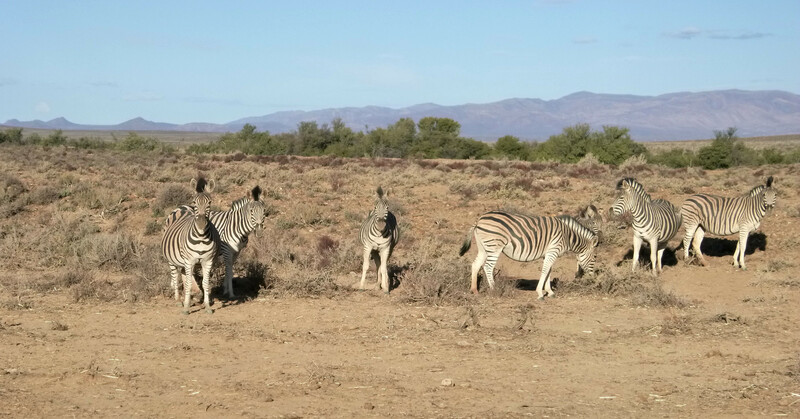 Tanya's parents arrived first and went off on a safari to the Inverdoorn Private Game reserve. Zebras 3 links as the sun was setting on Thursday evening. The reserve likes to keep its cheetahs fit by having them chase a dead chicken tied to a rope behind a land rover. Here we see this night's winner. The black springbok 2 links is as result of a genetic mutation which would quickly be eliminated in the wild as they would easily be predated. Now apparently, they are prized as hunter trophies so survive as an oddity to be added to other trophies on hunter's walls. Was thinking of offering a major prize to anyone managing to see these chicks in the pic above... but then.